Boutique is a great starter theme that will fit almost any kind of properties - hotels, inns, holiday rentals, B&Bs. Easily change fonts and colors to make it fit your own brand. These are just some of the pages that you can easily create with Boutique Theme. A custom page template lets you display all your rooms for an easier comparison. Your room pages will be displayed (by default) in a three-columns layout. You can have a blog on your hotel's website. Simply create some Categories for your posts and start writing. You can easily create an extensive directory of attractions and activities that are available in your area. Upload your logo, change colors and fonts from the backend to make the theme match your brand, without touching a single line of code. You can upload your own logo directly from the back-end. 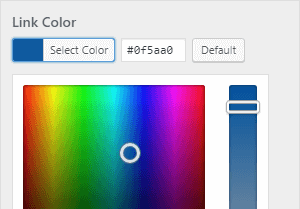 Make the theme fit your brand by changing many colors directly from the back-end. 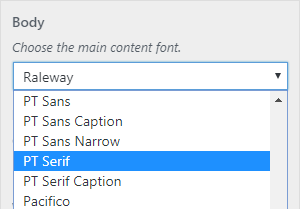 Easily use any of the 800+ custom Google Fonts that are integrated into the theme. A list of hotel reservation systems that our clients use on their WordPress websites. We offer a 30-day money back guarantee, so joining is risk-free! Get instant access to Boutique theme. Get your site up and running today! One year access to Boutique theme. Get instant access to all our WordPress themes. Perfect for developers and agencies. One year access to all 18 WordPress themes. One year access to new theme releases. All licenses are auto-renewed after one calendar year for continued access to updates and support. Cancel, Upgrade or Renew your account at any time after signing up! *Prices listed are in USD. Below you can find answers to some of the questions that you might have. Can I create a multilingual website? Yes. You can easily create a multilingual WordPress website using a special third-party plugin. Our themes are fully compatible with the popular WPML plugin used to create multilingual WordPress websites. A WordPress theme's main purpose is presentational, it is a design first and foremost. A WordPress theme is NOT: a booking engine, a property management system (PMS), a central reservation system (CRS) or a revenue management system (RMS). A WordPress theme can be used in combination with such third-party services, it is not meant to replace them. Here's a list of third-party hotel booking engines used by some of our clients. Can I use Visual Builders? Yes. Even though our themes are completely independent of third-party plugins, you can extend their functionality by using plugins like Elementor, Visual Composer, Beaver Builder, etc. Is the Demo Content available? We provide a convenient way to import the theme's demo content directly from the back-end with a few simple clicks. All texts, photos, menus and widgets will be automatically set up for an easier and quicker start. How can I pay for the themes? We accept payments via PayPal and 2CheckOut (2CO) for all major credit cards. We do not accept payments via Western Union, wire, cash, cryptocurrencies or other means. If your membership expires, you can continue using the themes you've downloaded, but you won't have access to the latest theme files, support, or new theme releases. We'll send you a reminder when your renewal is coming up, no surprises. How much does it cost to renew my subscription? Your subscription will renew at a discounted price (~40% discount). Subscriptions can be canceled at any time from within your account. We offer refunds to any unsatisfied client up to 30 days after the purchase was made. Please consult our Refund Policy for more information. What do I need to use your themes? A web hosting plan with PHP version 7.0 or greater and MySQL version 5.6 or greater. The free WordPress software, which can be downloaded here: http://wordpress.org/. WordPress.com provides limited free hosting for your website, a great starting point for personal websites, bloggers, etc. Or you can download the WordPress software for free at http://wordpress.org/ and install it on your hosting package, which is what I recommend to do. Only if you have a premium WordPress.com Business Plan. Sites hosted for free at WordPress.com cannot upload custom themes. You will have to use the free, open-source WordPress software from http://wordpress.org/. Can you install WordPress for me? Sure, we can install WordPress on your domain. Please Contact us with your order details. Can you install my purchased theme for me? Quick, efficient support is provided via email and via Live Chat on our website. We will not provide any theme-related support via Twitter or Facebook. What is the Support Schedule? The usual response time is less than 45 minutes during regular work hours, Monday through Friday, 9:00am - 6:00pm (GMT+01:00). Response time can be slower outside of these hours. I'll be glad to hear from you, so send me a message. Let's talk about how we can help your business.